I'm so looking forward to seeing this one! Another one I haven't heard of. Should I pick up the book? I've felt that sentiment before though -- both sad about something and happy about life. It's Young Adult but I enjoyed the book and it's a very quick read. I haven't seen the film so I'm not sure how it compares. I've seen the trailer. Looks like a good one, albeit I'm not in its target demographics. I probably will see it in a second-run theatre. I like the main character, but not his friend, who is in We Need to Talk About Kevin. That's another book (Lionel Shriver) into film. Have you read or seen it? It's his look that makes me uncomfortable maybe because of his role as Kevin in that movie. For Wallflower, it's interesting to see that the writer of the book turn his book into a screenplay, then, gets up and directs it. I've actually blogged at length about both the book and the movie version of We Need to Talk About Kevin -I agree Ezra Miller is creepy. He has the most intense, eerie eyes which just compounded his freak factor in that film for me. BUT from what I've heard he is really excellent in this movie. 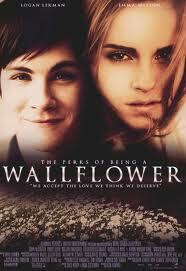 I think you read Wallflower right? If you did you know his character is certainly the most out there while Logan's character is much more the observer and reluctant participant. I am definitely NOT its demo and I imagine the theatre will be crowded with teenagers but I'd really like to see it. Great minds think alike, Arti! I posted this last Thursday ( http://chapter1-take1.blogspot.com/2012/09/must-see-les-miz-extended-first-look.html). isn't it fantastic? can not wait. I think Hooper's genius at this point is casting this amazing bunch. They've just put out the first poster today too, just about to post it.